Street improvement time! In the neighborhood that would become the Ridgway Historic District, the big news was that Benton street would finally become the town's northern most thoroughfare, opening a straight shot between the Southern Pacific train station on North St. and Ripley Street. At the time, Benton didn't connect between Glenn and Morgan (see map in a previous neighborhood article). For a new street to be added retroactively, several landowners might need arms twisted to convinced them it's in their own best interest to give away a swatch of land to the city, in the hopes that they would profit greatly by selling many small home lots on their former pasture or orchard farmland. Although this deal seems like a no-brainer today, great-grandpa sometimes seemed to have no brains at all; it wasn't unusual to read in the newspapers that someone foolishly demanded the town or county pay full freight for some nearly worthless sliver of land. For example, that summer of 1909 ended a three year-old city campaign to widen Fifth Street and transform it into a sister boulevard to Fourth. What killed that vision was the unbudging price by a man named John McCormick for a ten-foot strip of frontage at B street (which, in fact, he might not have legally owned). In the Benton Street deal, the arm twister appeared to be our own James Wyatt Oates. In August, 1909, he was elected president of the Sonoma County Automobile Association and vowed to promote the "betterment of good roads." A month later he was making a rare appearance before City Council and mentioned "property owners between Glenn and Morgan streets were contemplating the opening of Benton street." And just five short weeks later, the property owners handed over right-of-way to the city to allow construction of the new block to immediately begin. Likely attorney and Association president Oates did the legal work gratis. Oates' appearance before the City Council was also to present a petition that the city use Mendocino Avenue for the new 20" sewer line, "to relieve the very unsanitary and unfortunate overflow of sewage during last winter, which everybody agreed was deplorable." This was a surprising bit of news; at the time, a small item in the papers reported that the intersection of Carrillo and Mendocino was flooded because the storm drain backed up during a downpour. And there I was imagining the squeals of children splashing around in their wonderful neighborhood lake, not groans of disgust from nearby homeowners. Also in local news for 1909 was the renaming of "Joe Davis" street to Healdsburg Avenue. Residents of that short block had petitioned the city council since 1900 to have the name changed, and finally won. Thus endeth another link to old Santa Rosa. The bulk of articles transcribed below, however, concern improvements to nearby streets. Mendocino Street - the section between Fourth and College - was paved, and a load of crushed rock was spread on College Ave. The difference underscores the two faces of Santa Rosa; business streets in the downtown core were now mostly asphalt because of the exploding number of automobiles in use. College Avenue was still a busy farmer's horse-and-buggy thoroughfare across town, not to mention the route used to drive cattle herds to the slaughterhouse from the Southern Pacific stockyard on North Street. College would still be pretty bumpy ride with its new coarse gravel, but as the PD noted, "It has been a long time since any work of a permanent nature was done" on that street at all. And then there was the surprise that there were still wooden plank curbs all around town. Wooden street curbs hardly seem worth the bother, given that they're likely to rot and fracture, particularly when made from a soft material like redwood. But that was the 19th century standard, and a Google image search reveals they can still be found in New Orleans' preservation district, albeit in the expected shabby shape. In behalf of property owners in the section Colonel J. W. Oates addressed the council and asked that the new twenty-inch main that is to be laid from the College avenue section to the sewer farm be run from Mendocino avenue instead of Ripley street, so as to relieve the very unsanitary and unfortunate overflow of sewage during last winter, which everybody agreed was deplorable. City Engineer Newton Smyth said in his opinion the new twenty-inch main from Ripley street to the sewer farm would relieve the conditions mentioned, but would not say that it would entirely eradicate it. In response to a petition presented by Colonel Oates and other property owners the City Council ordered that cement walks be laid on Benton street from the Southern Pacific depot to Glenn street on both sides. Col. Oates also mentioned that property owners between Glenn and Morgan streets were contemplating the opening of Benton street through to Morgan, and the giving of a deed of right of way. Crushed rock was also ordered placed on Benton street from North to Glenn street. The matter of street repairs was considered at some length and it was decided to remove the basalt blocks on Mendocino street, lay a base of Healdsburg gravel with a binding of crushed rock, similar to the roadway at the Northwestern Pacific depot, and then bituminize the street. All sewer, water, gas and wire connections are to be laid in the street before the work is done, and the property owners will be assessed for half the cost. John S. Taylor and James O. Kuykendall have had the old redwood plank curbing removed and a concrete curbing laid along Mendocino street in front of their residence properties. They have also had concrete gutters laid. The work is a marked improvement and adds materially to the appearance of the street. The old wooden curb along Mendocino avenue in front of the Riley property is being removed and is to be replaced by a modern concrete curb and gutter the entire length of the property. The change will greatly improve the appearance of the thoroughfare and add to the value of the property. The improvement of College avenue from Mendocino avenue to Fourth street has been commenced and Contractor J. D. Sullivan is at work putting in cement curbs and gutters. It is the plan to lay these curbs and gutters the entire distance between the points named and then the city will put down crushed rock on the thoroughfare. The advantage derived from this improvement will make College avenue one of the best boulevards in the city and will greatly enhance the appearance and value of property. It has been a long time since any work of a permanent nature was done on College avenue and everybody is pleased to see the work commenced. The lack of lights on College avenue, where dirt has been thrown into the street from the excavating for the concrete gutter and curb, and piles of gravel and mixing boxes strewn along, makes that thoroughfare very dangerous at night. Sunday night from Slater to Humboldt street there were no lights and with the heavy shade of the trees along the north side it was almost impossible to keep out of danger. Unless more care is taken in protecting such places in the public streets there may be a serious accident and some one may be killed or crippled. Arrangements have been completed for the deeding to the city of the right of way through several pieces of property for the opening of Benton street from Glenn to Morgan street. City Surveyor Smyth has made the survey and secured the descriptions to be placed in the deeds to be drawn by City Attorney Ware. When the deed has been prepared the necessary land will be transferred to the city for the purpose stated. Property owners in the vicinity have raised the funds for the purpose of defraying the cost of removing the house occupied by County Clerk Fred L. Wright and owned by Mrs. M. F. Calderwood, which partially stands in the lot to be deeded. It is understood that the house will be moved around so as to face on the new Benton street, and in all probability a new house will be erected on the corner by Mr. Wright. E. D. Seaton, who owns considerable frontage on Benton street, between Mendocino avenue and Glenn street, is preparing to erect several two-story modern houses on Benton street as soon as it is opened through to Morgan street. H. H. Moke, who owns the entire half block facing on the north side of the new street, and W. E. Nichols, who owns the other quarter block on the south side, are both contemplating improvements on their property. When the street is opened it will give a main thoroughfare from the Southern Pacific depot to Ripley street and divide the drainage of storm water which is now all carried on Carrillo street during the rainy season. The street opening will be a marked improvement to that part of the city. Deeds were signed and passed Saturday for the required land for the opening of Benton street from Glenn to Morgan streets, and the street will be opened at once. H. H. Moke, W. A. Nichols and Mrs. M. F. Calderwood are the property owners affected. Mrs. Calderwood will be compelled to move one of her houses which is now partially in the proposed street. Monday the fences were removed from the Moke and Nichols property and preparations are being made for the immediate clearing of the Calderwood property so that the street can be put in condition for use before the heavy rains begin. Work is progressing rapidly on the other part of Benton street, which is being given a heavy coat of crushed rock. The rock has been laid from Mendocino avenue to a point half way between Orchard and Beaver streets. A number of the property owners are also laying cement walks along the street as ordered by the Council, while others are making preparations to do so. The laying of cement curbs and gutters on College avenue is also progressing rapidly. The work has practically been completed on each side as far as Slater street and will be pushed right along as fast as possible. Both of these streets present a much improved appearance where the work has been completed. A long road lay ahead for James Wyatt Oates in 1909, and he was determined to drive every last mile of it. Santa Rosa was quite the car-crazy town that year. Someone's purchase of a new auto merited an item in the Press Democrat, the same as for a birth announcement; when the latest models arrived for sale it was important enough for a full article (it probably didn't hurt that the downtown dealerships were increasingly buying large ads in the paper). And for years to come, Santa Rosans would still be talking about the 1909 California Grand Prize Race, which drew thousands of visitors to town and was won by local hero Ben Noonan. But probably no one here was burning with auto fever more than the 59 year-old attorney with the fine house on Mendocino Avenue. Prior to his buying a car, Mattie and Wyatt Oates could be counted upon to host spectacular parties at their home. In 1908, two hundred guests showed up for an engagement party, and there were at least four major parties at (what would become known as) Comstock House in 1907. But in 1909 there was only a small dinner party and a couple of weekends with house guests. Mattie Oates and her mother did host a debutante party for a trio of young women, but it was held at the Saturday Afternoon Club and not at the Oates' home, as in years past. Although their social calendar was nearly blank that year, Oates' name appeared in the papers far more than before, as the "Colonel" took family and friends daytripping. Off to the Petrified Forest, Healdsburg, Inverness, Mendocino County. Their house guests "were taken on a number of excellent auto trips in Judge Oates' splendid machine" and always, "the Colonel's fine touring car ran like a charm." Thanks to Oates' weakness for bragging, we know exactly the make and model of his ride: It was a 1909 Chalmers-Detroit "30" touring car, with a top speed of about 50 MPH and boasted about 25 miles per gallon. (Pictured below is the 1910 model, which differed only slightly.) The surprise here is that Oates chose a mid-price, mid-performance vehicle - even Chalmers-Detroit offered models that were faster, larger, or more luxe in other ways. The "30" was, however, reliable; the roadster version won a race that year for being the only car that crossed the finish line without problems. Still, one might have expected Oates to pick something flashier; it's a bit like discovering your teenage son, who just won't shut up about the latest and greatest ends up passing by a tricked-out Corvette for a sensible Honda SUV. The new car brought entry into a new social circle, most prominently friendship with 43 year-old widow Dorothy Farmer (think Farmer's Lane). That summer Mrs. Farmer purchased a Packard in Los Angeles and drove all the way to Santa Rosa with her 22 year-old daughter, Helen. No easy feat, that, in the day when roads were horse trails; expect to find more about the remarkable Dorothy Farmer in future pages. It was also probably gratifying that Oates, an outsider by nature, was elected president of the Sonoma County Automobile Association that year. As the primary aim of the group was to lobby for better roads, Oates finally had the opportunity to follow his famous brother into politicking, albeit in a small way. The Association's meeting was held at a redwood grove easily reachable by autos (natch) and the highlight was a surprise drop-in by Ben Noonan in his race car. "When Noonan stepped from his machine he was immediately surrounded by a band of the younger element present," the PD reported. There under the "glorious shade of stately redwoods and alongside a sparkling, babbling brook," three generations shared their madness for motorcars and the bright future for same. Col. and Mrs. Oates have received their new automobile. They anticipate enjoying my much pleasure out of the machine. Colonel J. W. Oates is just longing for sunshine so that he can get out his Chalmers-Detroit touring car. He is promising himself all kinds of good rides. Colonel James W. Oates and a party of ladies drove to Healdsburg on Thursday in Mr. Oates' Chalmers-Detroit. Colonel James W. Oates and party spent Sunday at the Petrified Forest and on Porter Creek. They drove in the Colonel's handsome touring car. Several days ago Colonel and Mrs. James W. Oates and Mrs. M. S. Solomon enjoyed a drive and outing in their fine touring car, visiting the Petrified Forest and other places of interest in that section. The Oates' take much pleasure out of their machine. Judge and Mrs. James W. Oates are entertaining Captain and Mrs. John B. Milton, of Mare Island, the visitors having come to the City of Roses to view the pretty Rose Carnival. Captain Milton is commander of the "Independent," the receiving ship at Mare Island, and a man prominent in naval affairs. He and Judge Oates are friends of many years' standing, and are linked together by peculiar circumstances which cements this friendship the more firmly. They became particular friends back in 1879, when Captain Milton first came to the Pacific coast from Annapolis, and Judge Oates was then residing in the metropolis. Mrs. Oates, then Miss Mattie Solomon, introduced Captain Milton to Miss Hattie Steele, and he wooed and won the heart and hand of that lady. She is the granddaughter of Commander Steele. Captain Milton, in turn, introduced Judge Oates to Miss Mattie Solomon, and the gallant judge lost no time in wooing Miss Solomon and asking her to be the partner of his joys for life. The reunion of these four people here at the Oates home is one of the joyous occasions of their lives and they are enjoying it right merrily. Captain Milton and his wife are affable people, and are making friends of all they meet in the City of Roses. Colonel Oates and the Rev. George T. Baker enjoyed a drive to Healdsburg the other night in the Colonel's fine touring car. Colonel and Mrs. James W. Oates and Mr. And Mrs. Shirley Burris had a very delightful trip into Lake and Mendocino counties last Saturday and Sunday. There was not the slightest hitch to and the pleasure and the Colonel's fine touring car ran like a charm. Talk about feeling good, then Colonel James W. Oates was the man after the wires had flashed the news that the Chalmers-Detroit car had won the great Indiana trophy race. Colonel Oates has a Chalmers-Detroit of exactly the same make an model of the one that carried off the honors. Judge and Mrs. James W. Oates entertained some friends at a week-end party at their handsome home on Mendocino avenue last week. Miss Madge Fairman of San Francisco, Miss Sadie Morrell of Duncan's Mills, and Charles H. S. Rule of Duncan's Mills were the guests. They had a delightful time in the City of Roses with their charming hosts, and besides the hospitable entertainment at the Oates home, were taken on a number of excellent auto trips in Judge Oates' splendid machine. The guests spent Friday, Saturday and Sunday at the Oates home. At their picturesque home on Mendocino avenue Saturday night Colonel and Mrs. James Wyatt Oates had a very charming and unique affair. If was very informal, too, and was in the nature of a "Bohemian Evening." One feature was a Spanish supper. The menu was composed of many dainties and the idea of the party was carried out down to the colors, very cleverly by Mrs. Oates, who is always equal to any occasion when it comes to delightful entertaining. Her gusts on this occasion were loud in their praises of her hospitality. The decorations were also in keeping with the general scheme. Mrs. Rogers of San Francisco, wife of an army officer, who has been here for a visit with Mrs. Edward F. Woodward, and also with Mrs. Dorothy Farmer and Mr. Spitz of Los Angeles, were the guests of honor. The guests lingered long at the tables enjoying the good things and the entertaining conversation. Then the remainder of the evening was devoted to music and other forms of entertainment. Colonel and Mrs. James W. Oates and Mr. And Mrs. Shirley Burris will drive in the Colonel's big touring car to Inverness today. They will return this evening. At the Clubhouse on Tenth street last night there was a large and brilliant party given by Mrs. James W. Oates and her mother, Mrs. M. S. Solomon. The function was in honor of Miss Catherine Rockwell, Miss Margaret Metcalf and Miss Hazel Farmer, and they certainly must have felt much complimented at the attention shown them. The hospitality shown by the hostesses was very delightful, and all their guests spent a very enjoyable evening. Dancing was the principal feature of entertainment. 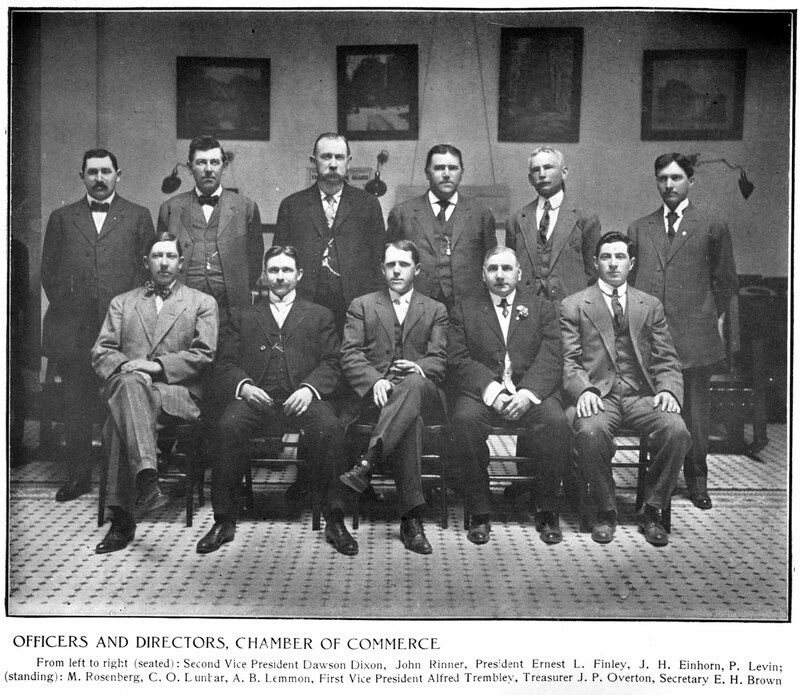 ...After luncheon had been served the business meeting was called to order by Dr. J. H. Seawell of Healdsburg, vice president of the association. Attorney J. Rollo Leppo is on a vacation and was not able to be in attendance. Secretary Don Prentiss had the top of a large rock for his table and sat on the ground. Hon. James W. Oates was the only nominee for president for the ensuing year, being nominated by Dr. S. S. Bogle and seconded by Attorney Edward M. Norton of Healdsburg. Dr. Harry Leppo moved the nominations be closed and the motion was seconded by Sheriff John K. Smith. The question being put, it was unanimously carried and the secretary was instructed to cast a ballot to elect Judge Oates unanimously. ...Great satisfaction was fe;t and expressed by the members that Judge Oates accepted the office tendered him and all feel that he will inject much interest into the good road question during his term in office. ...Ben Noonan drove a party of friends to the picnic grounds in his great racing Stoddard-Dayton "No. 12." When Noonan stepped from his machine he was immediately surrounded by a band of the younger element present, headed by Harrison Leppo. They immediately took possession of Mr. Noonan and he was soon answering many questions propounded by Leppo, Jr. Not foolish questions either. It is doubtful if a more intelligent lad for his years on the matter of auto mechanism can be found anywhere. He and Louis Norton, son of the Healdsburg attorney, share honors. Colonel and Mrs. James W. Oates and Mrs. Solomon drove to the suburban home of Mr. and Mrs. Blitz W. Paxton, near Healdsburg, the other day. They were much interested in watching the harvesting of the hop crop. In the years straddling the turn of the last century, it seemed everyone in Santa Rosa was coming and going to the Russian River during the summer months. For many of them, however, the appeal of the river area had less to do with water activities than the siren call of rocking chairs in rented cabins, croquet and bowling and billiards with friends from town, hotel service, and for some above all, eating. Much has been written about the river scene from the mid-1920s onward, but info about the first decade of the river resorts is scarce, although they were a central part of Santa Rosa life in early 20th century summers. Where exactly were these places, and what were they like? Why would someone prefer to go to Camp Vacation instead of Summerhome Park? After picking through out-of-town newspaper ads, railroad timetables, maps and atlases and all those "personal mention" columns tracking local residents, I present (what I believe to be) the first cross-referenced map of the Russian River byways during that era. My early confusion centered upon the tangled names. Some spots were known by two or more - the Olivet train stop became Woolsey and Trenton became Laguna, for instance - and making matters worse, the Santa Rosa newspapers were sometimes sloppy about accuracy. Before Eaglenest became Rionido, then later Rio Nido, it was also in the papers as Eagle Nest, Eagle's Nest and Eagle's Nest Camp. And don't even ask about Camp Six. It's also tricky to judge the popularity of any of these places. A new get-away popped up almost every summer during those years, while the paint was still almost fresh on the oldest resort, only about a dozen years old. Time spent anywhere on the river was still a novelty, something to talk about with your neighbors and friends, and the next time you went maybe you'd try another place that you'd heard good things about. To Foster, however, belongs much of the credit for opening up the Russian River country as a vacation land. Informal camping in the forests and two-week rocking-chair sojourns at American plan, pitcher, basin, and thunder-mug resort hotels had long been common. Foster was thinking in terms of summer homes and traffic for the Guereneville Branch where logged out country had left rusty rails. He bought some of the cut-over land, now green an bushy with second growth...[soon] Guerneville converted itself from a hard-drinking, bullwhacking lumber camp to a village of parasols, mandolins, and ice-cream sodas. It's not the job of this Santa Rosa-centric blog to tell the story of railroads, but I wish more history was available on how Foster and his railway developed this area. Did the NWP plan and build the resorts, then selling or leasing them once profitable? 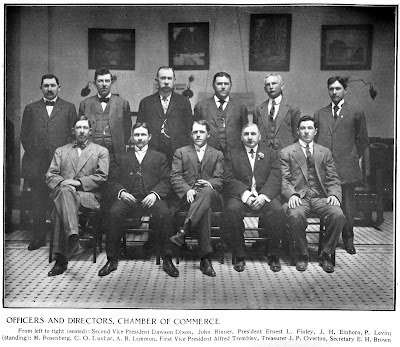 The intriguing thread tying most of the resorts together was Santa Rosa's industrious Cnopius family, who were apparently managing nearly all of them at different times between 1896 and 1906. Did they work for Foster? Mrs. L. C. Cnopius (no first name found, sorry) was particularly key to the progress, and her importance was even noted in San Francisco obituaries. Mrs. Cnopius is also known here for being the last direct victim of the 1906 Santa Rosa earthquake. MIDDLE: NWP Locomotive No. 99, "Coffee Grinder"
The first resort to open was Mirabel Park, which soon became a particularly popular spot for large groups - unions, churches, fraternal organizations - to hold day-long Sunday picnics. So great was Mirabel's appeal that it threatened the overall success of the area. In the 1900 San Francisco papers it was reported that "many families fear to take [Russian River trains] owing to the dread of coming in contact with Sunday picnics," although the railway assured the public that "this road has had no trouble on this score." Still, they promised to herd picnickers into separate train cars: "In the future, therefore, no one traveling on the California Northwestern Railway on Sundays will come in contact with Sunday picnics." Mirabel Park was also somewhat unusual in this era for having a "villa" offering actual boarding rooms. More common were partially-furnished bungalows for rent or sale, should you have the overwhelming urge to buy a tiny shack with no running water or electricity. And these cottages near the river did not sell cheap; ads from real estate brokers listed them for $400 up, about three times more than a place in Camp Meeker. Bungalows were suited for anyone spending the season on the river or planning to entertain friends, as many people did. But most people vacationing for a few days or so stayed at one of the tent hotels, adults $2/day, $10 per week, children under ten half-price. 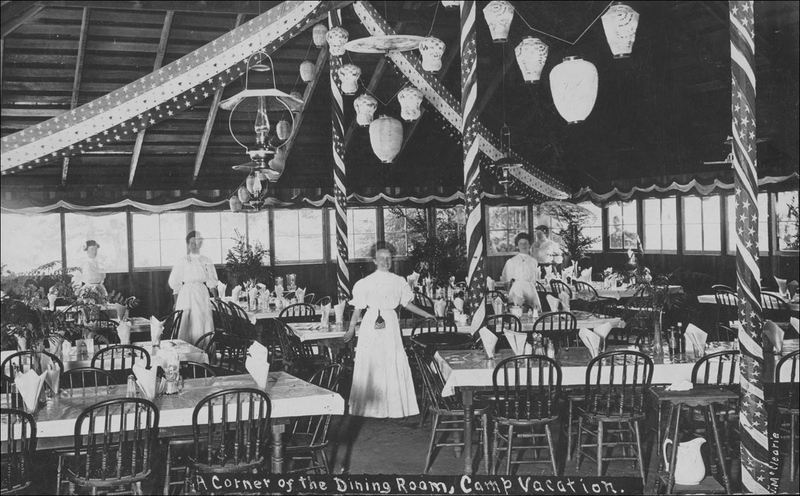 An advertisement for Camp Vacation describes the accommodations: "To sleep beneath a tent, to pass the day in the open air and have nothing else to do is to camp with luxury. Camp Vacation makes this easy for all. It is a hotel under canvas. Regular hotel service is furnished, but the guests live in tents. The tents are provided with wooden floors, are well furnished and are taken care of by those in charge." ...When I first arrived at the camp I did not have a very big appetite, and I was surprised to see my friends eat. Their table manners seemed to have been left at home. They grabbed everything in sight with both hands. They would drink out of the bucket in preference to using a cup and wipe their mouths on the tablecloth. 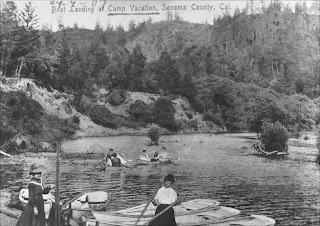 For Santa Rosans and other locals, the most popular resorts - or at least, the most often mentioned in the newspaper columns - were Camp Vacation, just across the river from Bohemian Grove, and Eaglenest, location of modern-day Rio Nido. The latter included bungalows and a true resort hotel, complete with a "box ball" bowling alley (a cross between a half-length 9 pin bowling lane and and a looooong coffee table, often found in arcades at the time - photo here). 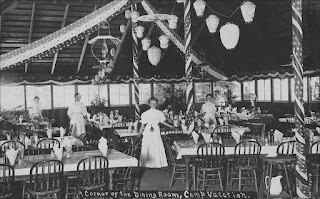 Besides four miles of beaches, Camp Vacation offered tennis courts, and it's worth noting that tennis and box ball bowling were among the few genteel sports where women could compete against men. But maybe the best part of those months was having the entire lower river available as your personal playground. When passenger and freight trains weren't scheduled, the railway used the tracks to offer a kind of trolley service using an ancient steam engine and open railway car recycled from the old timber days. Meeting your friends at a particular swimming hole by catching a ride on the "Coffee Grinder" - which looked like an oversized toy, and puffed away at less than ten miles per hour - added to summer's delight. Even the James Wyatt Oates family joined the river stampede, in their own way. The couple escorted a couple of girls a family friend and her daughter to a 1909 house party at the home of Charles Rule in Jenner, where they visited at least once a year every summer or autumn. This chapter of the resorts ended in late 1909, when the NWP line finally met the narrow gauge railway that came up the coast. After that the railroad began promoting the "Triangle Trip" Sunday excursion trains from San Francisco, a 150-mile ride with a little stopover at Monte Rio. A day out of the city sitting on trains while watching some nice scenery, then home for dinner. Oh, look, there's a beach. Those trees look tall. Gee, I wish there was only some way I could stop thinking about work. To Interfere With Regular Sunday Travel. The California Northwestern Railway is making heavy preparations for handling next season's business, and among other things will give special attention to its Sunday travel. The section which this road traverses is more than attractive for short Sunday trips, but many families fear to take them owing to the dread of coming in contact with Sunday picnics. While it is true this road has had no trouble on this score, it is determined to eliminate from the minds of the public all idea of this contact. Although the picnics up the road to Mirabel Park, etc., have in the past been kept separate from the regular travel, there will be none whatever this coming year, and those attending Schuetzen Park will be run on separate boats and trains. In the future, therefore, no one traveling on the California Northwestern Railway on Sundays will come in contact with Sunday picnics. I hear that box ball in the bowling alley at Eaglenest has been a fascinating pastime for a number of our society women who have been spending a portion of their vacation there during the past few weeks. So interested did they become, some of them, in the sport, that quite a little good-natured rivalry was aroused as to who could make the highest score. I know one lady who made a record score, but social excommunication is threatened if the newspaper divulges the name. Some of the best players, however, are members of the Irene Club and some of them have been guests of Mrs. Charles A. Wright at her bungalow at Eaglenest. Colonel and Mrs. Oates, Mrs. Dorothy Farmer and Miss Hazel Farmer were included in a house party at Rule Ranch as the guests of Charles H. Rule. Colonel Oates will return the first of the week, but the ladies will remain for several days longer. The hospitality of Rule Ranch is always very cordial. Camp Vacation as the name of a railroad station on the Northwestern Pacific is a thing of the past. In future the place will be known as Rio Campo and unless the name of the popular resport which was created by Lewis C. Cnopius is maintained, the name of Camp Vacation will disappear forever. To the efforts of Mr. Cnopius and the late Mrs. Cnopius Camp Vacation owes its great popularity as a resort and its wide reputation over the state. With the changes that come and go. the railroad company has determined to call the station at the place Rio Campo, and with the completion of the bridge near that place there will be no other stops on this side of the river for the trains will continue their journey across the bridge and on down to Monte Rio. With the coming summer season the loop completed by this bridge will make the redwoods section even more popular than it has been heretofore. Annually thousands of visitors spend their vacations in this delightful section. The rails are laid on the Monte Rio side of the river, and everything is in readiness to connect the same when the officials give orders for the same.